Now that you have a “new” pool coated with Epotec a few simple techniques will keep it looking great for years. Epotec is designed to provide a long lasting, functional and protective finish, while looking good. As with all products, a longer life will be achieved when it is looked after correctly. EPOTEC should be allowed to cure for 5 (Summer) – 7 (Winter) days before filling the pool. This is to allow a full cure to happen before subjecting it to chemicals. After the first 6 hours (at 25C) or so of application any rain that falls on the EPOTEC will have little impact and may be left in the pool unless it’s dirty water, (or rain run off over tiles/grout, pavers) in which case it may stain the new surface and should be removed. Cold overnight conditions (dew), high humidity, rain, garden water runoff and/or frosts may cause a white blooming on the surface, within the first few days. Leaking pipes and valves may create the same effects. Also water running over cement, tiles, pavers or grout may also cause lime staining on Epotec. This is aesthetic only and will not impact on the performance of the EPOTEC. It will look unsightly and can be removed, though it will usually wear off over 3-4 months or so, once pool is in service. To remove residues use a Scotch Brite Pad (or similar) and a mild abrasive like Ajax or Vim. It may slightly dull the surface. Diluted vinegar maybe used too. If hard to remove all residues and it’s aesthetically not acceptable a reapplication of a coat of EPOTEC will be required. Do Not enter pool until it’s sufficiently cured, usually 16 – 24 hours after any application. Any leaves, animals, insects should be removed as soon as possible so they don’t stick or stain the curing EPOTEC. Remove by careful scraping, sanding or washing. Leaf stains usually disappear once pool is in service. Be careful when accessing pool as coating will be slippery. Check that the Hydrostatic valve (if fitted) is working correctly. Fill with clean water. Allow to stand 24 – 96 hours max, then add chemicals (inc Salt) making sure they are well diluted first, in a bucket of pool water. Then mix into the pool completely. Any chemicals that are added directly may sit on bottom and result in concentrated chemical attack or stains and reduced life expectancy to the EPOTEC. Follow professional advice to get pool into the correct chemical balance. Whether you care for your pool yourself or use a pool service professional, you should settle for nothing less than the best, for your water (and your pool), at all times. If using a Cu/Ag system monitor and keep ion concentration low to prevent staining. If having your pool professionally maintained then make sure they set the testing equipment to painted surfaces, not any other. Otherwise incorrect chemical dosage may result, shortening the life of the EPOTEC. Also Total Alkalinity should be carefully maintained to prevent a powdery surface developing with attendant “pick up” on hands and feet and a shorter life. The EPOTEC is resistant to surface contamination and fungal growth. However over time the surface will tend to change with the attachment of slime and fat build up. This can be removed easily by giving the surface a “wash” with a broom or brush. The most affected areas will be at the water level, and within 300 mm of it. Body fats, suntan lotion and other matter that floats on the water surface will tend to stick to the sides of the pool. A regular scrub (bi monthly and more often in times of high usage) for this area should be a part of the maintenance program. Using “Creepy Crawlers” and similar are fine though make sure they don’t have seized wheels or hard plastic parts that will scape on the Epotec, wearing it down prematurely. The white powdery deposits (See below) if allowed to build up will through the abrasive action of pool cleaners, reduce the life of the Epotec and allow “colour pickup” and more so if pool has sand in it. One of the by-products of pool chemicals is the formation of calcium deposits on walls and floors. Calcium comes from the hardness of water, Salt, or the “Chlorine 65%”, in previous section. This can usually be seen as a whitish “scum”. It may be noticed if you wipe the surface with your hand and you see a white “cloud” in the water. The EPOTEC will be glossy underneath. It should be removed as can act as an abrasive when pool cleaners in use and reduce the life of EPOTEC. It can be removed by using a flocculating agent. See your pool shop for specific details. Epoxies slowly chalk as they age. EPOTEC is resistant to this however it will happen over time. It’s a natural process and will be more noted on darker colours. It’s a fine white powdery deposit on the surface and may be quite hard and difficult to remove, unlike a calcium build up. At the end of winter it’s a good idea to give the pool a good scrub to remove any winter build ups and prevent “blue” hands. EPOTEC is both water and vapour impermeable meaning it protects the underlying surface and wall components (such as reinforcing steel) from the ravages of salt water. As a result if any (ground) water or moisture gets behind the coating it may generate blisters. These are not common, however if seen contact us for further advice. Other causes can be poor preparation, applying when temperature to hot, applying on wet surfaces. This is not the same as OSMOSIS in fibreglass pools which are slow to develop, usually contain smelly water and are there for the life of the pool if indeed it has osmosis. Should you see this developing in your pool, contact us. In some cases you may get stains. If these are seen within the first weeks, as random yellow – brown colouring over the surface, it’s most likely the hardener leaching to the surface. It usually disappears over several months as the pool gets into its normal chemical balance. Other causes are leaves etc, dropping onto the still curing final coating. Remove these when safe to do so before filling pool. 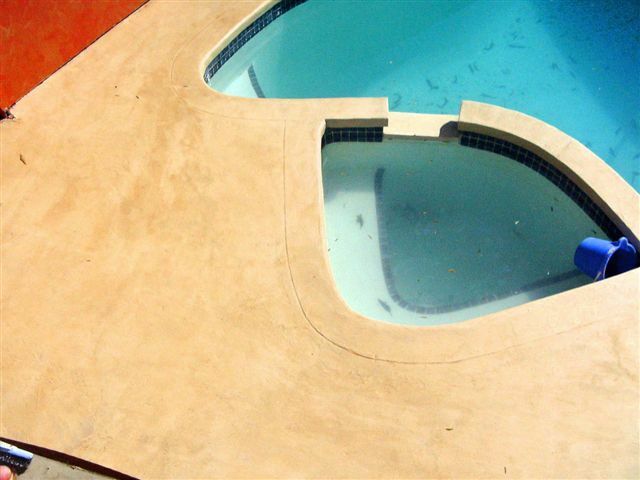 Stains after the pool in service maybe from rotting vegetation (leaves, twigs – tannins) or from mineral or metal build ups. Some water supply contains high amounts of metals which can react with “salts” in pools to create metal stains. Your nearest pool shop is the best place to get advice. You may also get metal stains as result of reactions in salt chlorinators. In the unlikely event your pool surfaces are damaged and the film integrity of the EPOTEC punctured, there is the prospect of water from the pool getting behind the EPOTEC. This will also allow the pool water with its corrosive salts, chlorine and other chemicals to come into intimate contact with the now unprotected concrete. Chemical attack of the concrete is possible with the result that it will fail, and there by undermine the further integrity of the EPOTEC. Any such damaged areas should be repaired promptly. We have touch up kits for this and they can be used underwater. Pools are very simply, mild chemical baths. EPOTEC is used mainly to protect the surface (and underlying structure) from the ravages of these chemicals. Most pools and spas use some form of chlorine for sanitation. Chlorine is a strong oxidizing agent and is quite dangerous if mishandled. Hence for pool use its either sold in diluted liquid form (12.5%) , tablets or generated via a salt water chlorinator. There is a lot of information written about pool water chemistry. Much of it by commercial enterprises who are keen to sell you something. There is little unbiased information available for the home pool user. Pool water can be a very complex mixture of metals, nonmetals, salts, oxides, chemicals, oils and phosphates etc. ALSO the water you put into your pool (Bore or town supply) may also contain many salts & metals in small and varying concentrations. These can vary daily ( and within your street) and impact quickly on the pool water chemistry and how you need to deal with it. In one sense having a low maintenance pool is the most delightful experience and some owners achieve this year in year out. Others struggle to get theirs to run well. Why? The best place to get good advice is your pool shop, however not all are run by knowledgeable persons who can discuss your pool issues and take the time to work out what’s going on. Many simply run a simple computer test for pH, Chlorine, TA (Total Alkalinity) and CH (Calcium Hardness) and sell you some chemicals to add to your pool, in the expectation all will be well. Yet a few weeks later you are back seeking a solution to an issue. Why? Could the TDS be getting to high and causing additional problems? If you wipe your hand over the surface, just below the water line, you will see what looks like white chalk dust floating in the water, once the hand movement stops. The immediate reaction is the paint is oxidised and coming off. Yet if you rub hard against the surface no paint comes off at all. In fact you see a nice glossy coating showing up. What gives? Well in a nutshell the white powder is the insoluble residues for the pool chemicals. Often Calcium salts but can include others too. As an example Cheetham Salt has the following on their bags of pool salt: “… does not guarantee a clear pool in each instance and accepts no liability of any loss from using Sunray Pool Salt” So you need to know. These are now quite common, but are not “NO” maintenance. They do require care and attention. Firstly in an average size pool some 200 kgs of pool grade salt is used. And it’s topped up from time to time. This salt (Cheetham) is from sea water so it has the same composition as sea water, including sodium chloride (Nacl) along with other minerals like Calcium, Magnesium, and salts of these. There are many trace minerals and some metals too, along with fine sand. Some minerals are not (very) soluble and it represents about 0.6% (or more) of the amount of salt in your pool. Thus with 200Kgs of salt, then there is about 1.2 kgs (or more) of insoluble materials. A portion of these insolubles may be filtered out by the filter mediums, but some are very fine and are not removed, or the filter is ineffective and they remain in suspension for a period of time. Then if the water temp changes suddenly or the pH changes abruptly or the TA is heading higher, it may cause the remaining suspended material to drop out lining the inside of your pool. Also the Chlorinator itself may assist in creating insoluble materials such as calcium and alkali precipitate and resultant scale in the pool itself. In pools with liquid or granular chlorine, Sodium Hypochlorite is the most common sanitiser used. Calcium Hypochlorite (increases Calcium load) and Lithium Hypochlorite (higher cost, lower effectiveness) less so. However even Sodium Hypochlorite leaves a residue that’s about 85% salt, NaCl. This is reactive and may combine with other minerals and salts in the pool (water supply, rain water flowing across cement) to form insoluble salts too, much like those seen in Salt Water pools. 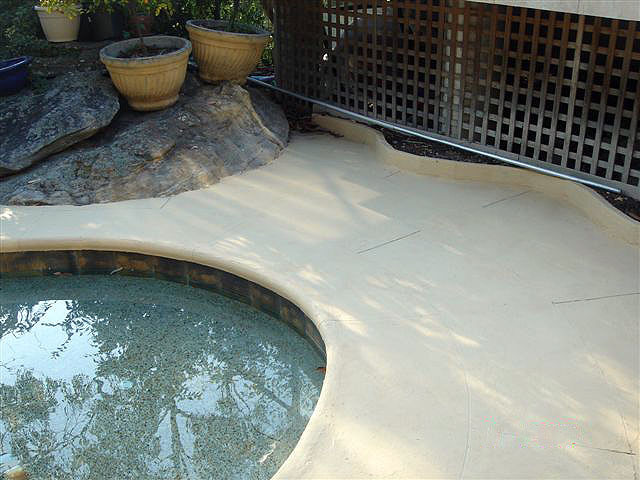 Pools with non-mineral surfaces can suffer from a low Calcium levels. If there is no Calcium in the pool lining, (non-mineral) then with rain water entering pool, (that’s calcium free) plus any limited Calcium in the pool is being filtered out, a deficiency exists. This upsets the water balance, leading to a loss of “buoyancy” to hold dissolved solids in suspension. Within a matter of minutes the dissolved solids drop out as a white film over the pool surfaces. What to do if your pool shows these signs? Discuss with your pool shop. We can also provide more information on the white film and how to get rid of it. Usually a flocculating agent will do the job. Note there are two Types: Aluminium Sulphate and Synthetic Polymer and either one may work. You may need to try both. If not successful then it may be that TDS is too high and the pool needs to be partially emptied to remove water and some of the TDS and replaced with clean, water. Only further testing will confirm this last approach as being needed. To get the best performance from the Epotec, look after it well, cleaning it every now and then. Keep the pool water in tip top condition throughout the year. Also note that chlorine, pool acid, and many other pool chemicals can do great damage to you and your pools health if not used correctly. You may need to call on other professionals to assist you in obtaining the very best in pool water maintenance.